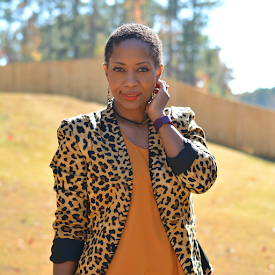 Thrift store coats are the way to go when looking for stylish and warm coats for fall and winter. They are extremely affordable and a good one will last you several years. I've bought winter coats at the thrift store as low as $5 and have gone as high as $15. Certainly there's one to fit your budget and your style. The trick is knowing what's worth buying. You don't want to break the bank on a coat that originally came from one of the fast fashion stores. It's likely super trendy and not well made. Here's what you should look for and what you should avoid. Living in Chicago, we spent a lot of time in coats due to the extreme cold. It's a key piece to your entire winter look. You definitely want to find a statement piece. Look for great button details, interesting embroidery, fun pops of color. My vintage leather coat with the fishtail was $10. At the time it was one of the most expensive purchases I'd ever made at the thrift. I couldn't imagine walking away from it though. I still love it today and that's impressive given my fashion fickleness. I'm not against secondhand fur coat buying but I'm funny about purchasing them in a charity shop. It's something that most likely will need to be cleaned and the cost will be high. You're better off buying one at an estate sale where it was well cared for with just one owner. I have purchased faux fur though. There's faux fur on the sleeves of this ASOS coat and I have a vintage faux fur jacket that's super cozy. I was able to throw them in the dryer with Dryel and not damage the fake stuff. This is not a chance I would be willing to take with real fur. By good bones, I mean natural fibers and beautiful, tight stitches. Look for simple, classic designs. Try it on. Does it feel good when you wear it? No scratchy fabric? This wool wrap coat is very simple. It's warm too. 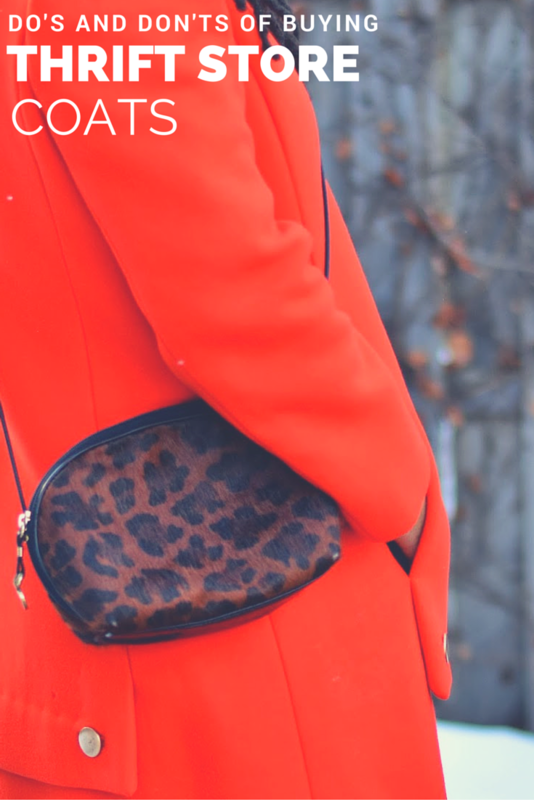 It's a great coat that can be worn with jeans or dresses. It didn't have any signs of wear when I bought it. The lining was perfect. The buttons are tight and there is no age discoloration anywhere. It stains easily so excellent condition is hard to come by anyway. If it has a tear, that's not likely to be an easy fix either. Suede, like fur, is not the project to take on without considering additional costs. It's a hard to clean item so you had better know exactly what you're doing if you really really want that particular coat. Even if you pay $75, that's still a good price for a coat. Anything more than that, I would seriously think about. It's not the ideal bargain price. I would probably go into shock if I saw that price at a thrift store but for the right coat, I'd be open. That's the price I have in my head for when I find my perfectly broken in leather motorcycle jacket with sleeve requiring no alteration. To date, the vintage orange coat is my most expensive splurge. It was $15. The color rocked my world. I love vintage coats. They have the best bones. They're extremely sturdy coats. Very well made. The wools and cashmere coats are super warm. Coat trends don't change as often as as clothes do so you can still be "in style" wearing an old coat. My all time favorite thrift find is the chevron print coat. My best guesstimate would put this coat at my age or older. The style is timeless though. It came with a dress that was too small. It was pretty basic so I wasn't interested in making it fit. Don't be afraid of torn linings. Linings are the first to go. The outside can be pristine and the lining will be jacked on the inside. No one will see it if there's a tear in the armhole. If it bothers you, you can stitch it up yourself. You can also take it to a tailor for repair or to be completely replaced. Preferably, with an interesting color or print! This isn't a cheap option so make sure the coat is worth it. This recently thrifted leather jacket has some lining damage. I have plans to fix it myself but if I don't get around to it in the next few months, I can still wear it! Do you buy thrift store coats?